The blood that flows through your veins contains your life force, and your blood group type can tell you a lot about your ancestors. Do you have O Rh D Negative Blood? O Rh D negative blood - or blue blood - sangre azul in Spanish, is a very ancient bloodline. I am sure you have heard the stories about the Holy grail and Mary Magdalene moving to the South of France with the children of Jesus. Behind all stories there is some truth, and when you start to join the dots with bits and pieces of information that we do have, a story unfolds. If you can forget all you have been taught, and open your mind to new ideas for a moment you will be amazed how easily you can allow yourself to see the big picture. There are many secrets that have been kept from us, and as more people become aware of there own inner divinity, the truth that has been hidden for thousands of years is finally coming to the surface. There used to be a tribe of highly advanced beings on the earth. You can look and find stories about them. They were the red headed Gods and Goddesses of legend. They lived in peace and harmony on Earth. Men and women worked together and they created a beautiful vast Kingdom - Eden? Atlantis? Hyperborea? Take your pick. They had no need for wars or conflict, because they lived in a heaven on Earth. Some say they were alien to the planet, however they just evolved separately from other humanoids. And although they evolved quicker than others, this was not because they are alien, it took them thousands of years to get to that point, the others just hadn't caught up yet. There were other beings on the Earth who evolved separately to these Gods & Goddesses, they were a simian race and not very intelligent. Some of the Gods decided to created a new race using their own genes mixed with the genes of the simians. The Gods knew about DNA and how to genetically alter things. Eventually they created some new beings that were half God and half simian beings, modern humans were born. They liked their new creation so much, they decided to take them as wives. The humans were so much smaller than the Gods, with narrow hips, and so they struggled giving birth to the children of the Gods. A new line was born with more of the genes of the Gods, but the mixing had caused some aggression and mental problems. The Gods did love their new creations, and taught them many things. However some of the Gods disagreed with what had been going on, and this interference with nature and ordered all the new humans to be killed so they couldn't breed. A flood wiped out most of the mixed humans, but some survived. The Gods watched as the humans evolved, and the humans adored the Gods as spiritual leaders - Kings and Queens. There was peace for a long time, as the Gods taught the humans how to grow things and build cities. They taught them about how the female body was in tune with the Moon, and how it effected everything on Earth. Their calendars were all Luna, and they venerated the females as creators and leaders. Because the calendars were Luna, they had 13 months in a year. Some of the males from the purer mixed line humans began to get jealous of the women and their power within the tribe, they decided to rebel and take over. They no longer wanted the spiritual teachings of the Gods and rejected them, took over their tribes and started wars with other tribes. They worked at hiding the true history about the Gods/Goddesses and matriarchy. They worked at suppressing women and any form of spirituality they could not use to control and manipulate people. They wanted as much land and control as possible. They created a religion that focused on one God, the Sun and male energy. They changed the calendars to Solar and 12 months, and said 13 was an evil unlucky number. By this point the humans and the Gods had become more or less the same size, only the Gods still had wider hips, bigger heavier bones and remained matriarchal, but had to go into hiding. Now we get to the time of Jesus and Mary, who were of the royal spiritual blood of the Gods, both with red hair, pale skin and O Rh negative blood. Mary Magdalene was the real teacher, Jesus was her partner, they belonged to a secret order that taught the truth, which is passed down secretly to it's members. Because it was not allowed for women to be spiritual teachers in the new patriarchal society, Jesus did take most of the credit for Magdalene's work. They were hated for trying to free people from the dogma they had been programmed to believe, and escaped to the south of France where they raised a family. The locals saw them as the spiritual leaders they were, and kept them safe for many generations. The stories of Jesus dying on the cross and many other stories are all allegory, and are not talking about Jesus the man, they are talking about the Sun in the wheel of the year and the four seasons, divided by a cross. The family spread out from the Middle East through Egypt, to Morocco and down to the Basque area of Spain, moving down to Castile, and the Spanish royal family carry this bloodline and have the sang grail, royal blood or blue blood, as did many of the royal families in the past. The Thracian royals also carried this bloodline. The ancestors also moved from the Basque area to the UK and Ireland, and became later known as the Picts - painted ones. They were eventually drove to the north of Scotland when other tribes invaded. The Picts carry the royal bloodline and created the Kings and Queens of Ireland and Scotland, and carried the truth still passed in their secret rituals and ceremonies. Do you have Pictish ancestors? There are some genes that identify Picts. Y DNA lines are Haplogroups J and I. mtDNA haplogroup H & U. If you are of blue blood you will have the red hair gene. See how red hair has been demonised for generations? In Egypt and other countries red haired people have been killed because of their magickal powers. In other places called Witches, evil, marked by the Devil. All because those controlling the world as it is now, never want the truth about our origins getting out and meaning they can no longer control people with their lies. The truth about the Witch hunts - the true spiritual royalty who carry the secrets from the past had to be removed, so the truth could never get out. But some of us have survived. The bloodline families can be traced back to Ramases in Egypt, the red headed King. I am using the term God and human, to differentiate between the spiritual leaders of old who created modern humans, and humans of today. O Rh negative - Pure blue blood of the Gods, very rare. O Rh positive - Mixed, God and human. The most common blood of modern humans. This is most likely the first humans created by the God/Human mix. A Rh negative - Mixed, God and human type 1. Very rare. A Rh positive - Human type 1. Very common. B Rh negative - Mixed, God and human type 2. Very rare. B Rh positive - Human type 2. Very common. AB Rh negative - Mixed, God, Human types 1 and 2. Very rare. AB Rh positive - Mixed, Human types 1 and 2. Very rare. All Europeans and most people in the world have some of the blood of the Gods, but the traits show up most in those with Rh negative blood. And just because you have say B positive blood, it does not mean that you don't have some of the traits, because European type 1 & 2 humans would have done very well to not be mixed with some who did carry the genes, but because the Rh negative genes are recessive more people are born positive. To be of the pure O Rh negative bloodline it would mean your ancestors are all also O Rh negative, which is why it is so rare, but higher percent of pure blood still survives in certain areas, and in some of the old royal families. It means that our current leaders are making a bad job of things because they are not spiritual beings. They only care about themselves and selfish gain of power and money. They want to keep everyone dumb and doing as they are told, while they have all the benefits. However, the children of the Holy Grail and waking up and finding each other again. They know the world is out of balance, and if we continue on this current path we will destroy our Mother Earth and all life on her. The time has come for us to awaken from our slumber, join together the old tribes and bring peace, harmony and balance back. 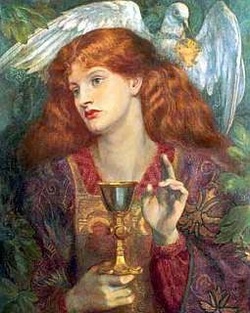 You will know if you are one of the Grail Children, you will recognise yourself as a Theolalite. Homo Erectus, this is where B positive blood came from and before that Gorillas. Homo Heidelbergensis, this is where A positive blood came from. Before that Chimpanzees. The genes of these ones were used with a small percent of Neanderthal genes to create the Cro-Magnons. The Cro-Magnons were created as a warrior race, who were supposed to be big and strong, and good for working. However, a little knowledge is dangerous, and they soon took over completely, killing off as many Neanderthals as they could. The Neanderthals were the tribe Kings and Queens, the Shamans... The ones who had decided to tamper with genes, had created monsters, unspiritual war-like Cro-Magnons brought patriarchy and war as they created a new - dog eat dog - culture. Cro-Magnon, these have mainly A positive blood. Neanderthals were the Ones that created, communicated & educated the Cro-Magnons before they rebelled against their creators. Neanderthals, these are where O neg blood came from. All rh negs carry this blood group, if you are A, B or AB neg you carry it recessively. If you are O positive, you also carry it recessively, and most other Europeans do, even if you are A or B positive.